Market information is more valuable than ever! Companies are willing to pay to get info about their target markets. Since market research is a daunting task, even for large companies, they often work with sites like GrabPoints to provide surveys to their members. GrabPoints only works with legit, high-paying companies. This means GrabPoints can give you the highest payout rates in the world! We can confidently say that no other survey site pays as well as GrabPoints. When you complete the survey, you’ll get the points. With some providers like TapResearch or TheoremReach (which GrabPoints connects you to), you can even earn for partial completions and disqualifications. As mentioned above, companies hire GrabPoints to distribute surveys to you and other members. 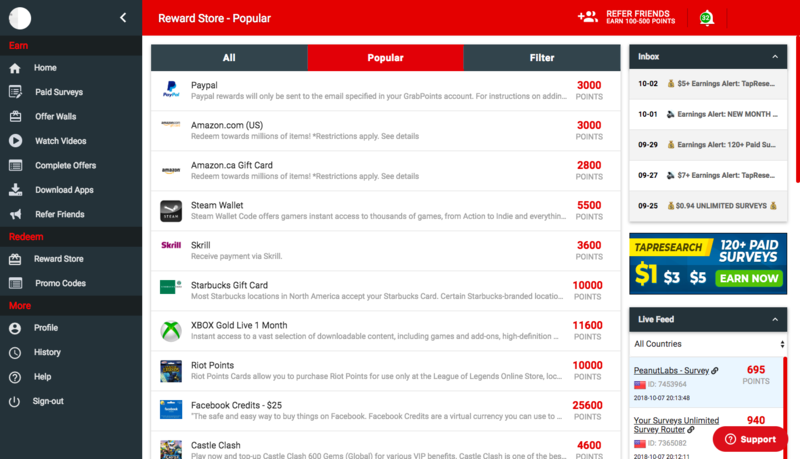 You earn points for completed surveys, and once you’ve reached the minimum amount of points required, you can redeem your earnings as cash or gift cards. 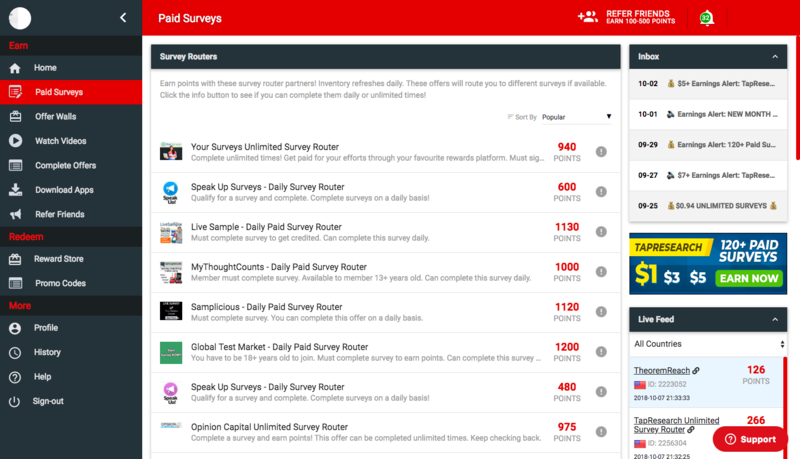 GrabPoints is also a survey router, meaning it acts as a portal for surveys being offered by other sites, such as YourSurveys (unlimited survey router), Opinion Capital (also an unlimited survey router), and LiveSample (daily survey router). You still sign up on GrabPoints, but you may also have to register and provide complete info when you use those sites. Registering here takes about 5 minutes, since you’ll have to provide your demographic info. You’ll add your basic info, such as name and email address, as well as more specific ones like your age, job, and gender. The info you provided in Step 2 is called demographic info, and the site needs it to know which surveys are appropriate for you. The site will curate a list of surveys that are a good match for you based on the info you’ve given. You will be able to see these surveys on the survey wall. Now it’s time to start earning! Surveys usually have their points value listed. When you complete the survey, you’ll get the points. With some providers like TapResearch or TheoremReach, you can even earn for partial completions and disqualifications. Take note, you may get disqualified in the middle of taking a survey. Don’t worry, it simply means that either the site has reached its quota of answers, or it determined that you’re not actually a good match for the survey. Some survey sites will give you a small fee if this happens, so be on the lookout for that. Whenever you finish answering a survey, the listed points will be credited to your account. Take note again that some providers will pay you for partial completions, or when you get disqualified. Once you’re done with a survey, go ahead and look for more. You will never be required to answer surveys you don’t want to – participation is purely optional, although it’s always a good idea to answer as many surveys as you can. To earn more, try to look for surveys with the word “Unlimited” in their title. That means they don’t have limits on the number of surveys you can take per day. Once you’ve accumulated a minimum of 3,000 points (worth $3 in real-world money), you can request a payout. These payouts can come in the form of cash (sent to you via PayPal) or as one of many gift card options. You will receive your reward within 48 hours. Don’t let the amount of info in this guide intimidate you – answering surveys on GrabPoints is an easy, fun way to earn. If you’ve got any questions about this, or any of our other earning methods, don’t hesitate to drop us a line.